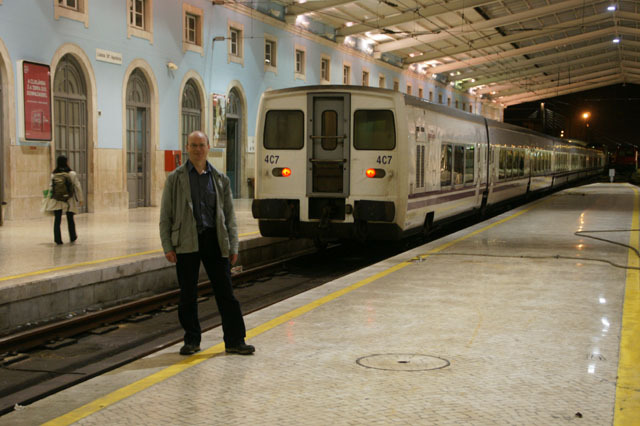 In April 2009 I travelled across Europe from West to East, using ordinary train services. The idea for the journey arose in a Brussels bar, A la Mort Subite, when my friend and frequent travelling companion Bill Bird asked if I would like to join him in Istanbul to celebrate his 50th birthday. He had chosen to be in Istanbul for his birthday weekend as his friend Beatrice would be there, as she was speaking at a conference the following Monday. I was certainly interested, as Turkey was one of the few countries in Europe that I hadn't visited. Naturally, I was keen to arrive there by train, and I proposed a train journey from Lisbon to Istanbul. I had a Thomas Cook European Rail Timetable with me, so we were quickly able to get an idea of the route and journey time. We did some more detailed planning over the next couple of weeks, making use of the excellent German Railways online timetable, which covers most of Europe. We did not want to make the journey as fast as possible, to give us chance to see a few places along the way, if only briefly. Our chosen plan was largely dictated by three border crossings (Portugal to Spain, Italy to Slovenia, Bulgaria to Turkey) which only have an overnight train service, so we had to use these if we were to use the most direct route. We settled on a Saturday evening departure from Portugal and a Friday morning arrival in Istanbul, with three nights on trains and three in hotels. The fastest possible journey would have got us into Istanbul on the Wednesday morning. We bought advance tickets and reservations on most of the trains by telephone through the Deutsche Bahn UK booking centre. This was extremely complicated, as both Bill and I are eligible for concessionary fares (as former BR staff), but with different entitlements, and many of the trains we wanted to use had special fares or required the payment of sleeper/couchette supplements or compulsory reservation fees. 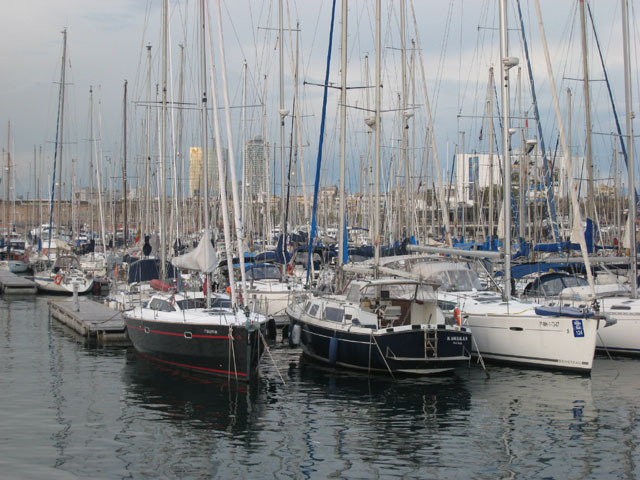 We were able to get most of the essential things sorted as far as Belgrade, but that was as far as their reservation system reached into the southeastern corner of Europe. Beyond there, we would just see what happened. Another useful source of information for European rail travel is The Man in Seat 61, and his site advised that the through sleeping car from Belgrade to Istanbul was not currently running. 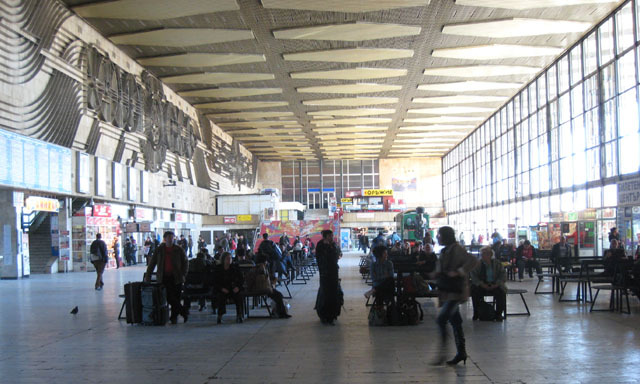 Instead, there were two separate trains: a Belgrade to Sofia day train, and Sofia to Istanbul overnight, which may or may not have a sleeping car or couchettes. We considered alternative routes, such as via Bucharest or via Thessaloniki, but in the end decided to stick with the route via Sofia. The total distance would be 4540km (2820 miles). As a prequel to the train journey, I flew out from Gatwick to Lisbon with easyJet, arriving about an hour late at seven in the evening. That still allowed plenty of time before catching the Madrid train at 22.30, and I took the airport bus to the city centre stop at Restauradores, where I had arranged to meet Bill outside the Hard Rock Café. Bill had arrived in Lisbon a few hours before me, and had amused himself by visiting Sintra and taking a local train across the April 25th suspension bridge to the south side of the Tagus. The HRC was full, so we headed towards the river while looking out for a restaurant. We soon found a seafood restaurant which looked promising, so entered and had a good meal there. It occurred to me that for the next few nights we would be having each evening meal in a different country, so we should make an effort to eat in the local style each time. We walked the rest of the way to Santa Apolónia station. It was cool and damp, in contrast to the warm spring sunshine that I had left behind in England. We arrived at the station with half an hour to spare, allowing time for photographs before boarding our train. The overnight train to Madrid is branded as a Trenhotel, and has three classes of accommodation: Turista, Preferente and Gran Clase. We had opted for the middle choice, Preferente, which gave us a comfortable 2-berth compartment and tickets for breakfast. Before settling down for the night, we had a couple of drinks in the bar car. I slept only sporadically, as I usually find it difficult to sleep on trains, and the ride quality of the 'Talgo' single-axle articulated vehicles was not good on the jointed track on sections of the route. We went for breakfast in the restaurant car, where we both chose the cooked breakfast option. The restaurant was fairly full, but gradually emptied out as we passed through the Madrid suburbs. The train takes a circuitous route into Madrid, passing to the south of the centre, then heading north through the eastern suburbs before turning 180 degrees to the left to enter Chamartin station from the North. We arrived on time at 8.25. The trains from Madrid to Barcelona depart from Puerta de Atocha station, so we first had to buy a ticket for a 'Cercanías' (suburban) train, which we did at a vending machine on the concourse. 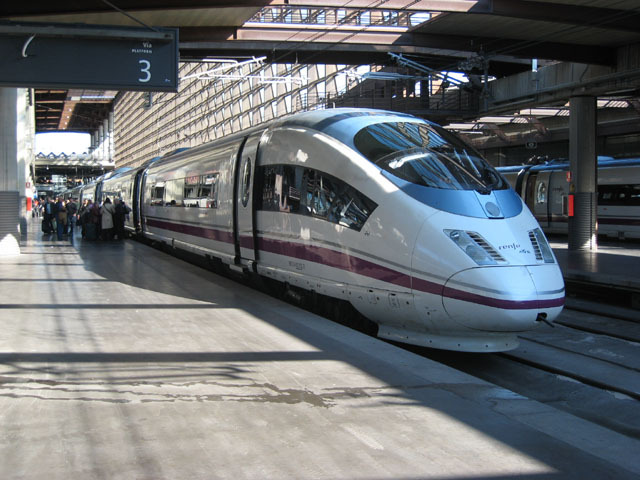 There are frequent trains between the two main stations in Madrid, but we found it difficult to work out which platform the next train would depart from, especially as some trains were shown as running late. At Atocha, we spent some time looking for the long-distance ticket office, before realising that it must be the place signposted as 'Renfe Customer Services'. The trains to Barcelona depart every hour so we had not bothered to obtain tickets in advance for this section. As this was a new high-speed line with new trains, we decided to splash out on first class tickets, made more affordable by our reduced-rate cards. Even so, the fare of 66 euros each was more than I expected, but perhaps that is because the short journey time is misleading, and it’s actually quite a long way. The normal first class fare is 165 euros. We were booked on the next departure, which left at 10.30 and was a train of the same type as the latest German ICE trains. The display at the end of each coach shows the train’s speed, which was 300km/h for much of the journey. This was by far the fastest section of our journey across Europe. A meal is included in the price of first class tickets, although as we weren’t travelling at a normal mealtime, only a snack was served on our train. After a comfortable and punctual journey, we arrived at Barcelona Sants station. Our hotel was near to Catalunya station, so we took a local train there and checked in, at the Royal Ramblas Hotel. We then went for lunch at a tapas bar nearby, while deciding what to do for the rest of the day. Our first stop on the tourist trail was the Sagrada Família, the towering church largely designed by Antoni Gaudí, which we reached by metro. This amazing building has been under construction for over 120 years, and is still far from complete. The inside of the church is very much a building site, but the museum housed in the crypt is very interesting, with details of the history of the building's construction, and of Gaudí himself. 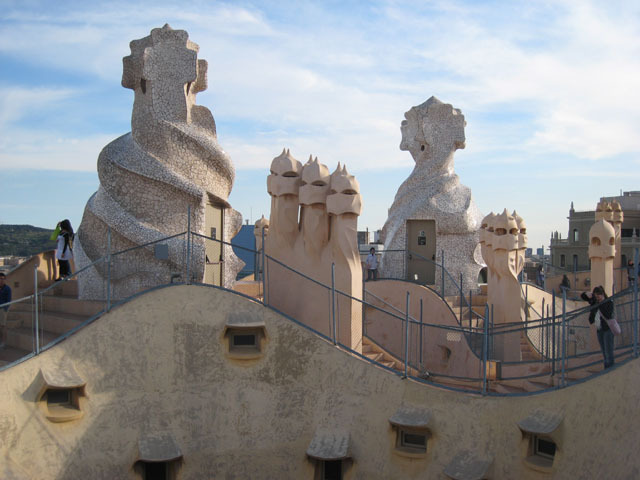 This inspired us to go and see another of his designs, an apartment block called Casa Milà (or La Pedrera). The roof terrace, with its chimneypot ornamentations, looked fine in the evening sun. We took the metro to the harbour area and walked around there before making our way back up Las Ramblas, through Plaça Real and into the network of narrow streets in the cathedral area. We found a restaurant in this area, where I had a paella. Our train was the 8.45 from Estació de França, and as breakfast didn’t start until eight, we checked out first so that we could be in the restaurant as soon as it opened, with the aim of stuffing as much as possible down our throats in ten minutes. We then took the metro, changing at Urquinaona, but it was such a long walk between the two lines here that we might as well have walked straight there rather than go one station along the line from Catalunya. At Barceloneta, we came out of the metro station and there was no indication of how to get to Estació de França. There was a map, but it was difficult to orient the map to what we could see on the ground. Bill reckoned to have worked it out, so we set off, and were relieved to see some directions for the station before long, as we didn’t have much time. At the station, we just had a few minutes to photograph our train, one of the older style Talgo trains, before boarding it. The train, named “Catalan Talgo”, now only goes as far as Montpellier in France, but until a few years ago it ran all the way to Geneva. The interior of the train was a bit shabby and dated. We went to the buffet car for a coffee, which came from a coffee machine which looked as though it should really be in a museum. 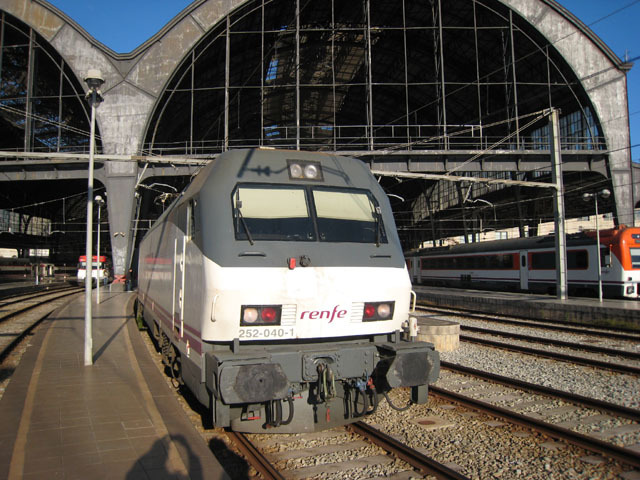 We reckoned that RENFE must have a workshop dedicated to the overhaul of coffee machines, with craftsmen skilled in the manufacture of replacement parts for long-discontinued models. At Portbou, just before the border, the train’s wheels are adjusted to run on standard gauge tracks rather than the Iberian broad gauge. This is done automatically while on the move, at low speed. In the station, the locomotive was removed from the front of the train, and a shunting locomotive was coupled to the rear. This then propelled the train onto the gauge-changer track. As each axle passes through the gauge-changer, the wheels are unlocked, moved inwards, and locked in the new position, as the rails move closer together. Once the front of the train had emerged onto the standard gauge tracks, a French electric locomotive coupled onto the front of the train, and pulled the rest of the train through. Then it was a short run over the border to Cerbère on the French side. There was a delay here while passport and customs checks were carried out. The timetable no longer allows for this, since France and Spain signed up to the Schengen agreement. A heavy rainstorm lashed the train as we travelled between Perpignan and Narbonne, and the coastal lagoons which adjoin the railway looked quite choppy. But by the time we arrived at Montpellier, the sun was shining again. The delay at the border reduced our time between trains at Montpellier from an hour to 30 minutes, so we just had time to purchase some lunch from a kiosk, and have a brief look outside the station. 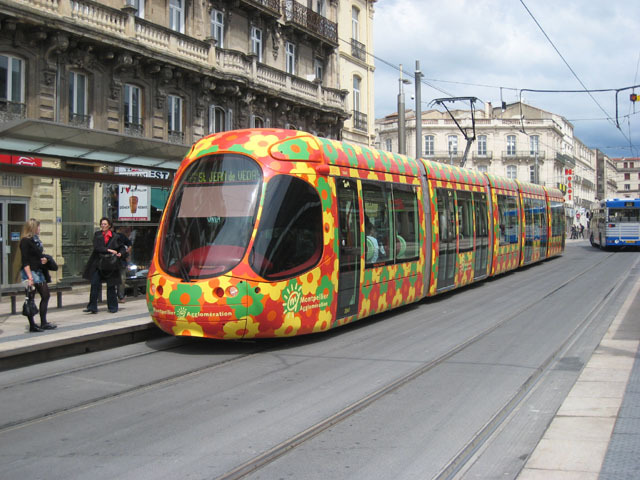 There were some colourful modern trams running. Our connecting train to Nice departed at 14.16, and we ate our lunch on the train. This train continued across the south of France, via Nimes, Arles, Marseille and Toulon. The weather continued to be changeable, with a mixture of sunshine and showers, but as we got to the scenic stretch along the coast the sun was shining. This train was also half an hour late arriving at its destination. In Nice, we checked in at the Hotel Windsor, about halfway between the station and the seafront. Rooms are decorated in different styles, and ours featured items designed by a local artist. We didn’t linger here, so that we could look around Nice while it was still light. We had dinner at a restaurant in the old town area, then continued our exploration on foot. An ice cream stall proved to be too great a temptation, and we both had deux boules despite it now being quite chilly. 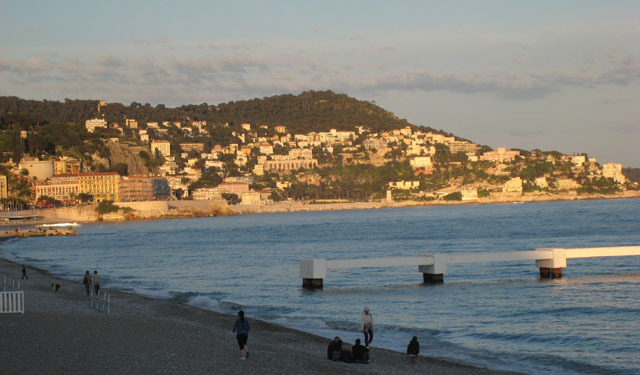 The beach at Nice, catching the last of the evening sun. 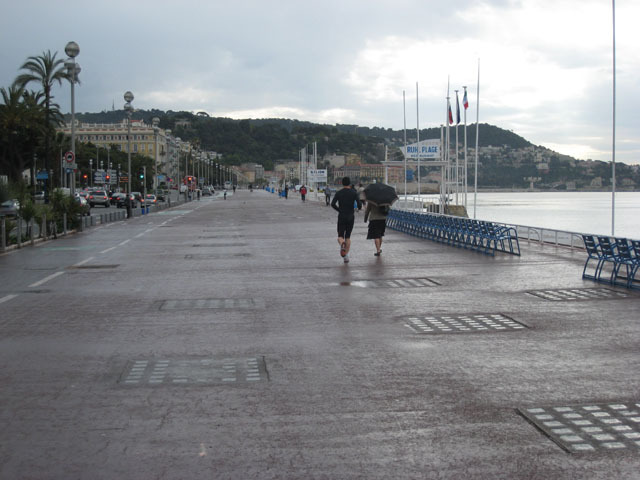 A later start this morning enabled us to have a more relaxed breakfast, and then we walked to the Promenade des Anglais. It was quite cool, with a few spots of rain. 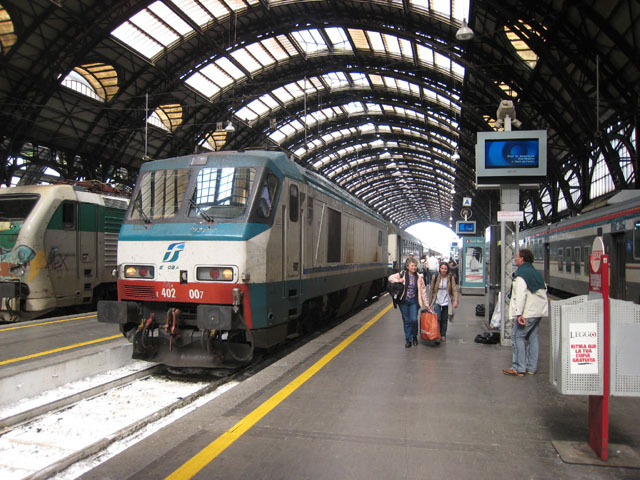 At the station, Bill had to buy a ticket to the Italian border, which only cost a few euros. Many trains were running late, due to staffing problems, but our train, the 10.02 Eurocity service to Milan, left on time. This train took us further along the Mediterranean coast, through Monaco and entered Italy at Ventimiglia. At Genoa the train reversed, to start heading in a more northerly direction, and the 20-minute stop there gave me time to buy two espressos from a vending machine on the platform. Not bad for 60 cents each, and certainly better value than yesterday's instant coffee for €2.20 from the trolley on the Montpellier – Nice train. We arrived in the magnificent Milano Centrale station just before three, and had a little over an hour here. So no time to look around, just go straight to the nearest decent-looking café and order some lunch. There was one on the corner of the square outside the station, which swiftly produced the pasta dishes and beers that we ordered. But I couldn’t help myself from calculating the price of the beer in pounds per pint: about £7, so it must be one of the most expensive I’ve ever drunk. Our next train was the 16.05 "Eurostar City Italia" service to Venice. This was a busy train, but we had seat reservations on it. It arrived in Venezia Santa Lucia station at about half past six. We had over two hours in Venice, so that meant that we had time for a token bit of sightseeing as well as dinner. 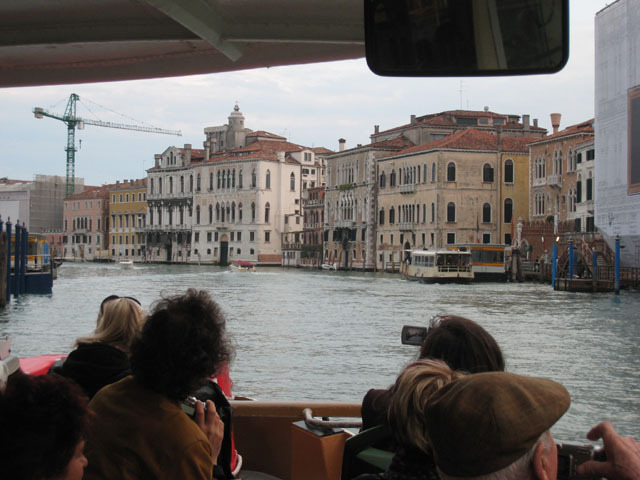 We took a No.2 vaporetto (water bus) from the station to Piazza San Marco, and from there walked back through the maze of narrow alleyways. Thankfully the route back to the station was fairly well signed, otherwise we would never have made it. There was a pizzeria near the station, so we ate there. The EuroNight train "Venezia" eastwards from Venice conveys a through couchette car for Belgrade, but we had been unable to make a reservation in this before leaving home, possibly because the reservations are held by Serbian Railways whose computers are not linked to the rest of the European system. So instead we were booked in a couchette car in the Budapest portion, as far as Zagreb, where we were due to arrive at 4.18 in the morning. We tried negotiating with the Serbian sleeping car attendant to see if we could travel in the Belgrade coach, but it seemed he didn't want any extra passengers, it would make more work for him. So we went to our allocated place in the Hungarian couchette car, and the friendly attendant there advised us that he would wake us with a breakfast tray before arrival at Zagreb. We had the 6-berth compartment to ourselves. I slept surprisingly well in the couchette, despite being woken for passport control at the Italy/Slovenia border (haven't they heard of Schengen?). I was already awake when the border guards came round at Dobova, just before the Croatian border, and then our breakfast arrived, consisting of fruit juice, a sandwich, coffee and a biscuit. 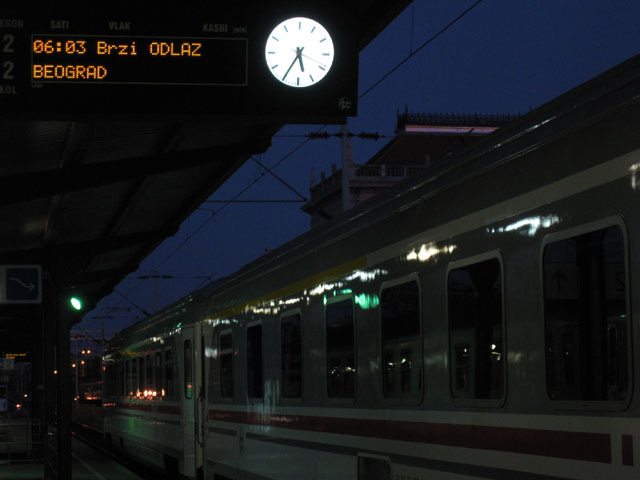 Soon after, we arrived at Zagreb and descended onto the cold, dark station platform. Now, what do you do in Zagreb at 5 o’clock in the morning? It's a bit too early for a beer, so I asked Bill if he wanted a quick guided tour. It was his first visit to Croatia, but my fourth time in Zagreb, so I felt competent to show him the main sites, such as the main square Trg Jelacica and the cathedral. You know The Independent travel section does a series called 48 hours in wherever? With all the quick visits I have made to towns, cities and railway junctions when I have a spare hour or so between trains, I could do a rival series "48 minutes in…". Any takers for "48 minutes in Strizivojna-Vrpolje?" Back at the station, our train to Belgrade was now in, so we boarded it and found an empty compartment. It was formed of comfortable, modern Croatian Railways stock, with the couchette car from Venice attached at the front. We spent the first couple of hours sleeping (or trying to sleep), but we were back in the land of the living by the time we reached the Serbian border at Šid, where we collected two more stamps in our passports. We arrived in Belgrade exactly on time at 12.25. This was a surprise, as Serbian Railways' reputation for punctuality, especially of long-distance trains, is among the worst in Europe. We checked in at our hotel, the Design Hotel Mr President, which was close to the station, and then went in search of lunch. We called in first at the "3 Carrots" Irish pub, but they didn't serve food so we came straight out again, and headed for the Kasina instead. We had visited the Kasina in 2004, as it brewed its own beer, but we are not sure that it does anymore. It still does good value meals, though. We returned to the station to sort out tickets for our onward travel. They couldn't book us on the sleeping car from Sofia to Istanbul – in fact they weren't even sure there would be one. But we were able to get tickets for travel as far as Kapıkule, at the Turkish border. There would be no buffet car on the train to Sofia, so we walked around the station area looking for a supermarket to get some provisions in. We couldn't find anywhere, and after walking for ages the effects of the early start to the morning were beginning to catch up on me, and we decided to return to the hotel for an afternoon nap. 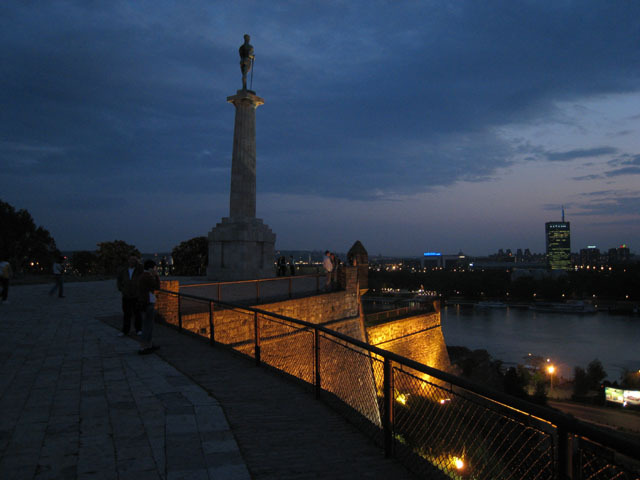 Suitably rested, we had a further walk around the main centre of Belgrade, including the main shopping street Kneza Mihaila and the Kalemegdan fortress. When it started to get dark we headed for the Skadarska area where there are a number of bars and restaurants. In our chosen restaurant we each ordered a mixed grill and a Lav beer, and enjoyed the live music. On the way back to the hotel we called in at the 3 Carrots where we each had a glass of Nikšicko dark beer. Our train for Sofia was at 7.50, so we arrived for breakfast as soon as it opened at 7 o'clock. When we came to check out, there was a woman at reception who was settling the accounts for four different rooms, and took ages. By the time we had checked out, there was only just time to get to the station, and no time to buy anything for the journey. The train had portions for Thessaloniki and Sofia, and there were no destination plates on any of the coaches, so we had to rely our railway knowledge to work out which bit would go where. The nationality of the five coaches was, from the front: Serbian, Macedonian, Greek, Bulgarian, Serbian. We deduced that the first three coaches were for Thessaloniki and the rear two would go to Sofia, so we found seats in the rear coach. 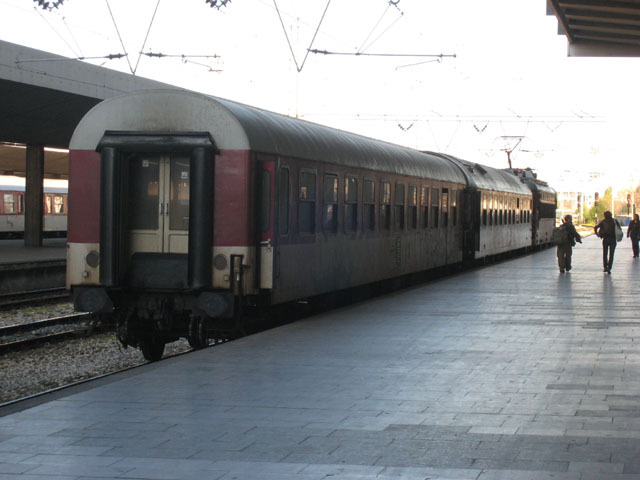 The train lost time on the way to Niš, arriving there half an hour late. This was where the train divided, and it was booked to remain here for an hour so I still had half an hour to buy some lunch, which I did at a baker’s shop just across the road from the station. The route from Niš to the Bulgarian border is quite scenic and very slow. Our compartment was now full. 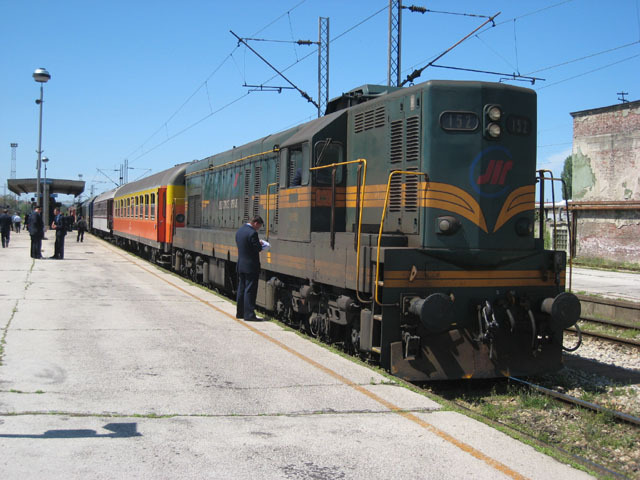 Our passports were stamped out of Serbia at Dimitrovgrad, where the Serbian diesel locomotive was exchanged for a Bulgarian electric. The snow-covered mountain Vitosha heralded our approach to Sofia, where arrival was more or less on time. From past experience, we knew to avoid the station "helpers", one of whom was shouting "Istanbul?" as passengers alighted onto the platform. These guys just take you to somewhere you are quite capable of finding yourself, and then demand 5 euros off you. We knew exactly where to go to buy tickets for the remaining unticketed part of our journey (Kapıkule to Istanbul), and get reserved in a sleeping car. This was done very efficiently, the only problem being that they would only accept Bulgarian Lev in payment, and we didn’t have any. So we had to visit a cash machine and return to collect our tickets. There wasn’t quite time for a proper meal before the Istanbul train left at 19.10. There was a McDonalds on the spacious communist-era station concourse, so naturally we avoided that and bought some stuff at a kiosk instead. The Istanbul train was a sorry-looking affair, just two graffiti-covered Bulgarian coaches. It was sad to think that the overnight service between Sofia and Istanbul was once the luxury "Orient Express". We got settled in to our sleeping compartment, and ate the food we had bought at lunchtime as well as most of what we had just bought in Sofia (saving some for breakfast in the morning). The embossed letters "DR" on various fittings showed that this sleeping car had previously operated in East Germany (Deutsche Reichsbahn). We knew from The Man in Seat 61 that we would have to leave the train in the early hours for the Turkish border control, so there was no point in getting undressed before bed. Some time after 11 o'clock we stopped at a station, and we heard the locomotive being uncoupled and moving away from the train. We were at Mihailovo, and a consultation of our Thomas Cook railway map showed that we were not on the direct route between Sofia and the Turkish border. The loco ran round the train and coupled onto the other end, and we set off again towards the normal route. Last train: Not the Orient Express. The graffiti-covered overnight train to Istanbul, awaiting departure time at Sofia. Shortly after midnight we arrived at Dimitrovgrad. Not the one we passed through a few hours earlier in Serbia, another Dimitrovgrad. The portion from Bucharest was attached here, and the electric locomotive was replaced by a diesel. We departed about an hour late, and settled down in our bunks again. An hour later, we were disturbed again as the train arrived at the Bulgarian border station Svilengrad. Passport and customs checks take place on the train here. There was also more shunting as the seating-only coach at the front of the train was detached. There wasn't much point in trying to sleep on the next section over the border, as within half an hour we were at the station on the Turkish side, Kapıkule. It was 2.30 in the morning, and we lay awake waiting to see what would happen. We soon heard the border guards making their way along the corridor, banging on compartment doors and shouting "passports, on station". We opened our door and noticed that people were not taking luggage with them, so we left the train, followed them to an office on the platform and joined a queue. The head of the queue was at a window, where passports were being inspected and stamped. But then a group of people were sent away from the window, and they informed the rest of the queue, in English, that if you need a visa (as British citizens do), you have to buy it at another place on the station. Somebody seemed to know where to go, so we followed to a kiosk which sold duty free goods, as well as Turkish visas for 15 euros. We were then able to go back to the original office to get them stamped. We didn't get back on the train immediately, but watched as a Turkish Railways (TCDD) electric locomotive was coupled to the front of the train. The train now had three coaches: our Bulgarian sleeping car, a Romanian Railways sleeping car, and a Turkish Railways couchette car. It departed at 3.30, on time again. I still didn't get much, if any, sleep, as it was very rough riding. The quality of the Turkish track was probably no worse than that in Bulgaria, but we seemed to be going twice as fast over it. Anyway we stayed on the rails. The railway approaches Istanbul alongside the Sea of Marmara, then passes the Topkapı palace before curving round to terminate at Sirkeci station. We arrived at 8.30, just 5 minutes late. It was the end of a really good journey, and another successful trans-continental journey completed. We had 3 days to see the sights of Istanbul, but the first priority was to get some breakfast, and then get to our pre-booked hotel, the excellent Emine Sultan, to crash out for a few hours and catch up on lost sleep. Three days is not enough to see everything in Istanbul, so I will be back again sometime. Maybe next time I will continue further into Turkey, and even beyond, to Syria, Iran, or even India if the security situation in Pakistan improves. 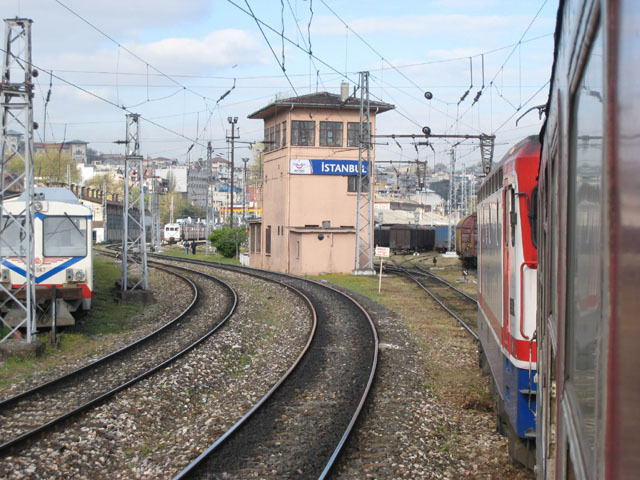 TCDD electric locomotive E 52511 leads our final train (from Sofia) past the signalbox on the approach to İstanbul Sirkeci station. 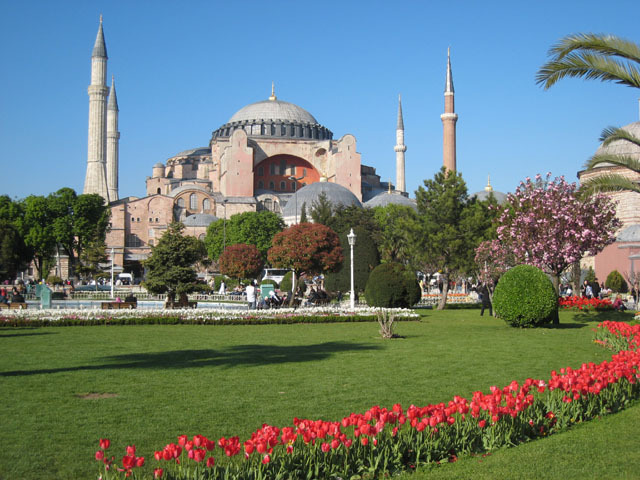 I flew back with easyJet from Istanbul's smaller airport, Sabiha Gökçen, which is on the Asian side of the Bosphorus.